Obtaining your doctorate is one of the toughest academic and professional tasks that you can take on. The stats on future employment in academic science careers are horrifying at worst or misleading at best. At the same time, many argue that we need more scientists with a PhD.1,2 With these statistics, it might be time to consider alternative careers. With the possible oversupply of PhDs and undersupply of positions, you might wonder if you should stay in academia. In my opinion, you should fully explore all the careers available. You might just find your perfect match outside of academia. Surprisingly, the world is full of opportunities!3 So why limit yourself? In this article, I will discuss four possible careers that you should consider. I am sure that you’re familiar with the large amount of jargon in the scientific literature. As a science writer or communicator, your job is to “translate” this jargon into layman terms. Imagine if you were asked to discuss the same content with your bestie over a steaming cup of coffee. Obviously, that would be an easy and enjoyable task. And this could be your career! All you need is a little training. Aside from doing the experimental work of science, you also have to consider the managerial aspects. You have to consider where you should submit your paper (and your back up plan if that journal rejects your paper), plan for your upcoming PI meeting, and order that crucial reagent for the experiment you will conduct next month. And many, many more things! Ideally, our research should better society. As a graduate student, we are provided with a nourishing environment for intellectual pursuits. On the other hand, industry converts these ideas into a business affair that can generate money. You can combine these two ideals in science entrepreneurship. If you have a great scientific mind and a zeal to bring your ideas into the ‘real world’ by taking calculated risks, then the entrepreneurship is something you should consider. Your college or university likely has a technology transfer office or an entrepreneurship center that can help you get started. Many of these centers include basic instruction on funding, researching competitors, market research, intellectual property issues, and many more topics. Those basics include networking, researching the market, knowing the preexisting competitors, financial security, intellectual property aspects, and much more. Hopefully, this article gave you insight into the many opportunities available for you outside of academia! Weissmann, Jordan. (July) The Stagnating Job Market for Young Scientists. Slate. McDowell G. (2016). 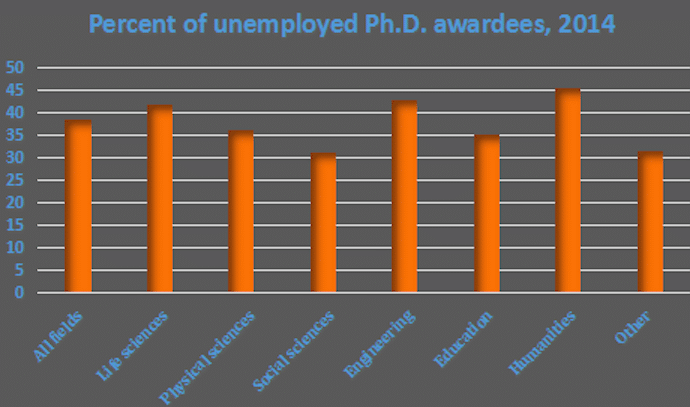 The Fool’s Gold of Ph.D. Employment Data. Science. Science Council (2018). 10 types of scientist. Hi Ankita! Could you comment on how to identify opportunities to learn science/project management principles? Thanks!